The rainbow of Shih Tzu Coat Colors ia a fascination for most Shih Tzu owners, and once buyers realize they have so many choices, that fascination often leads to an obsession. 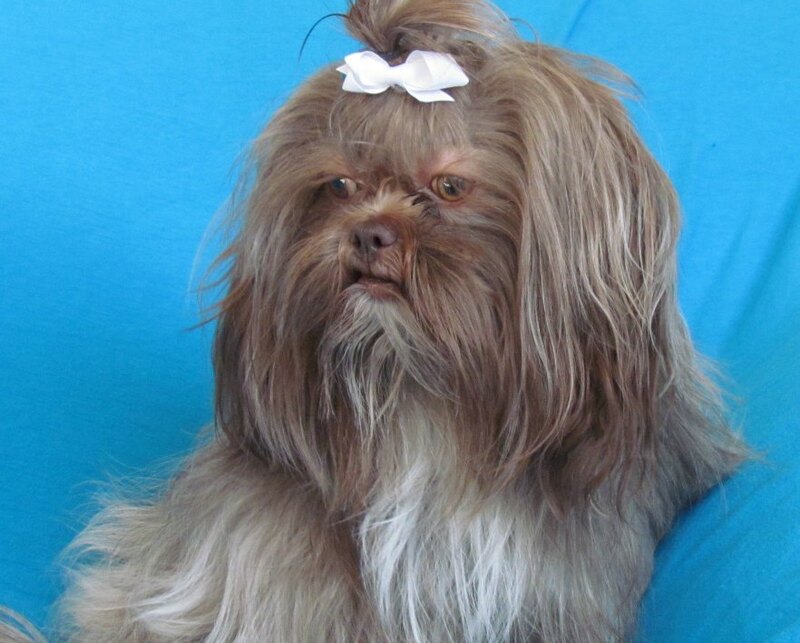 "All Shih Tzu Coat Colors are permissible," states the breed standard by the American Kennel Club. The Kennel Club in the UK, agrees. "All colours permissible, white blaze on forehead and white tip to tail highly desirable in parti-colours." "All colours are acceptable, but black noses, lips and eye rims are a must." tip to tail highly desirable in parti-colours." So, if every color is permissible, what colors are really available? When a person first looks or think about a Shih Tzu dog or puppy, they see the gorgeous coats of many colors characteristic of Shih Tzu Show Dogs. Unlike some breeds that are typically one color or a variety of a few colors, the Shih Tzu come in an amazing array of rich colors. 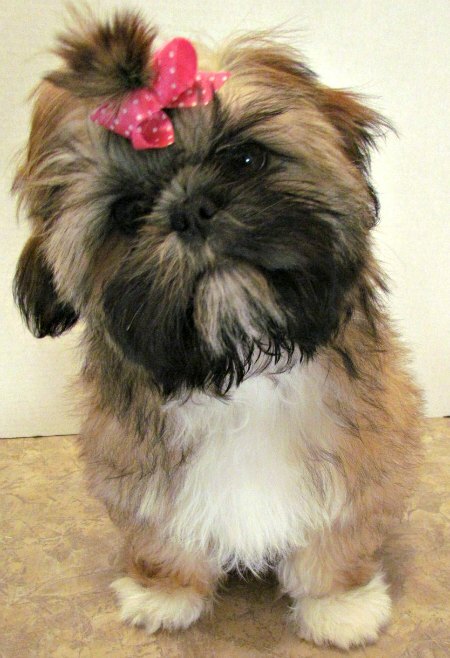 But with such a rich variety of Shih Tzu Colors, color combinations and markings comes a great deal of confusion. To make it even more confusing, a Shih Tzu's colors can change over time. 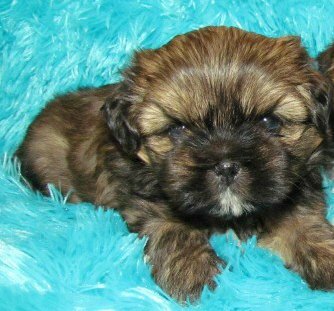 In this article about colors of Shih Tzu dogs, I will try to explain the many variations of colors that are present in the breed today and help you decide on your perfect Shih Tzu color. 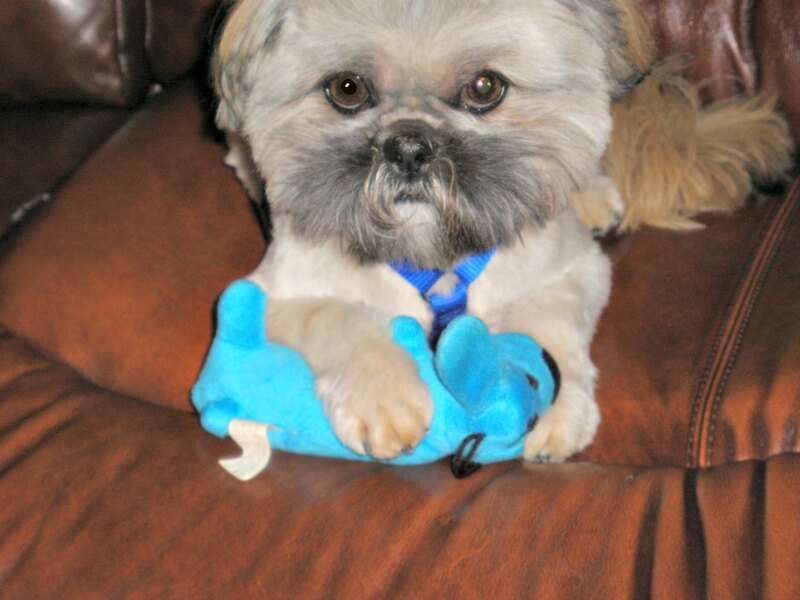 BUT, please note that the color of the Shih Tzu does not make the dog! When purchasing a dog, look for health, personality and temperament. 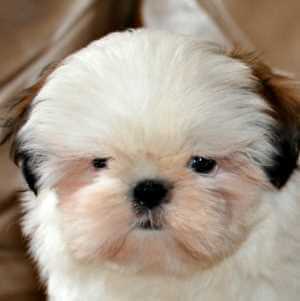 Shih Tzu puppies can be born with a solid color hair, a combination of two colors, or a mixture of three colors. To complicate matters worse, Shih Tzu dogs can be registered with the American Kennel Club, (AKC) based on the pigment of their skin rather than the color of their coat! Can the “experts” make it any more complicated? Well, the short answer is yes and no. Understanding what is considered a specific color can be even more difficult if you’re as nearsighted as me, so how does one determine the color of a Shih Tzu dog? If a puppy is going to be registered with the American Kennel Club, the breeder has a choice of eight solid colors, seven varieties of two color combinations, four combinations of three or more colors and a variety of different types of markings that occur with the combinations listed above. As you search for a specific color you are going to encounter breeders that have many different names for colors that are not recognized by major kennel clubs. These are not standard colors. All of these colors would be labeled liver if your puppy was registered with the AKC. 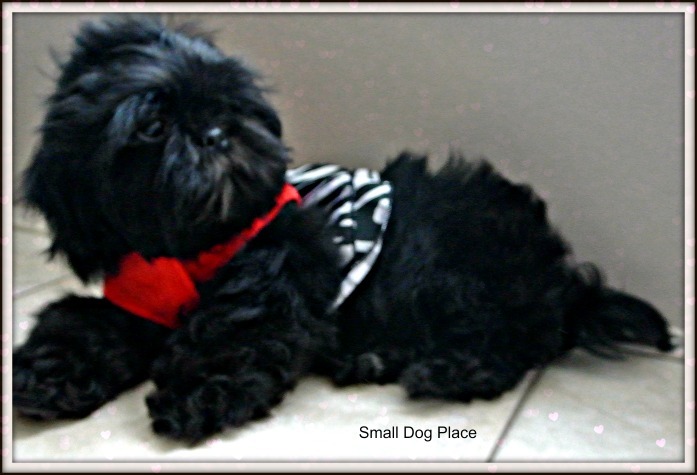 Black is the most dominant color and a true black Shih Tzu will have no other hair color. Even if there is a small trace of another color, the dog will then be considered to have a combination of two colors. All Shih Tzu dogs that have black hair will also have black noses. You will never see a Shih Tzu that is all black with a brown nose. It does not exist. I've seen rumors circulating on the internet that Shih Tzu dogs that are black do not occur and that the puppy must be a hybrid. That is not true. There are completely black puppies just very rare. A White coat is similar to black in that it only has one color with no traces of any other colors. The nose is black unless the dog is considered to be liver and then the dog will have a brown nose and be liver color. The American Kennel Club makes it a bit difficult for breeders whose puppies and dogs are not a pure white but rather more cream than a white. There is no option to describe a Shih Tzu as cream, so white is usually notated on the official paperwork. A silver color coat tends to look white with a deep shine resembling silver. It is not grey, but rather a shiny, silky color. The dog will have black lips, pads, eye rims and a black nose. Red is a solid color that looks deep, dark, orange. The dog's nose and other points (eye rims, pads, lips and nose) will be black. Gold solid resembles a tan-yellow, but there are a wide range of shades from a light tan to a deep gold. Brindle is really a combination with one color and a streaking of another color running throughout such as a gold-black brindle. Toby, below is an example of a red- brindle Shih Tzu coat color. Brindle is really not a color but a pattern that consists of stripes of golds, tans, browns, grays or blacks. Brindle coats all look different because in some dogs, the stripes are thicker or wider whereas in some coats the stripes appear to be very narrow. If the brindle includes liver or blue, the dog will be considered liver or blue. A true brindle designation will have black points meaning black eye rims, mouth, and paw pads. What appears to be a brindle coat when the puppy is very young can turn into something else as he matures. 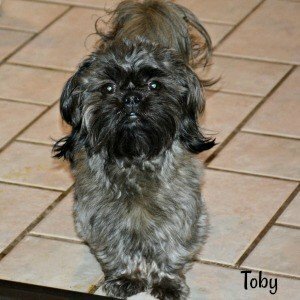 The picture below of Toby is when he was about one-year-old. He had a beautiful red brindle coat. The picture of him at six years old looks very different. He is still brindle but has lost much of the red and the brindling is less obvious. Brindling occurs as a complex reaction to several genes found at different locations (loci) on the gene. Red Brindle Shih Tzu, Tobu at one-year-old. Red brindle Shih Tzu Toby is now showing a faded brindle coat at six years of age. Liver colored dogs lack the black pigmentation of the skin. Their noses, pads on their feet and lips will be brown, but their hair may have other coloring, from very light to deep chocolate and everything in between. Livers can range from light red, orange, and cream coloration to deep chocolate. So, you could have a white-liver, a cream colored-liver, a red-liver, or a chocolate liver. Some Shih Tzu dogs may also have green eyes with this coloring, but not always. The liver color comes from a recessive gene and for it to show up in a puppy, both mother and father must carry the gene. 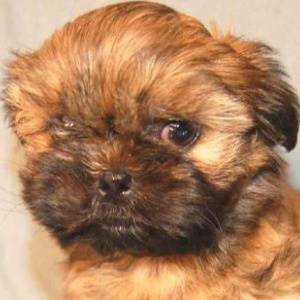 This lovely red Shih Tzu puppy would see, "liver and white," on his official AKC registration paperwork. Taco here from Dogwood Country Shih Tzu, has a stunning red color with just a bit of white on his chest. But look at his nose. Unlike the Red and White Shih Tzu above, little Taco's nose is brown. Technically, the American Kennel Club will describe him as a liver, even though he has that distinct red color that often looks more orange than red. 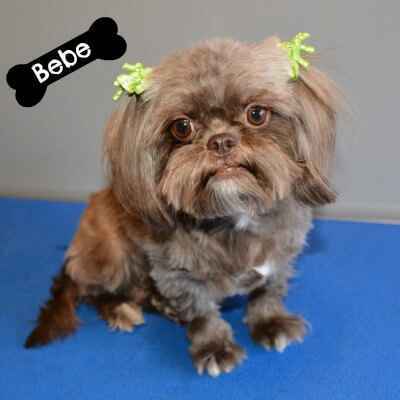 This little gal that you may have seen on this website is Bebe as a baby. This is Bebe as an adult. Her "chocolate" or brown coloring as faded. Blue is another confusing color. 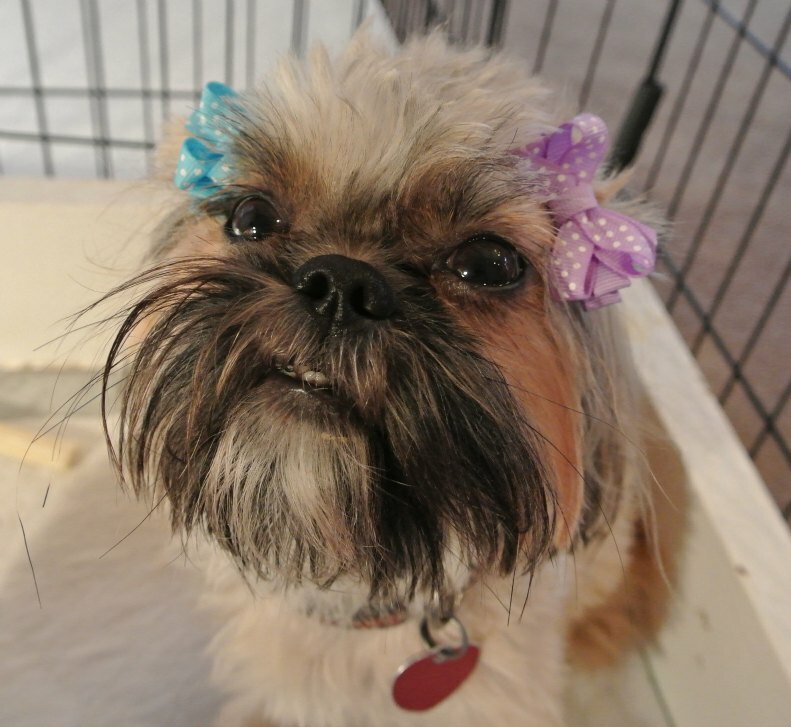 A true blue Shih Tzu will have a blue nose, but can have other colors of hair. The color looks more charcoal and is often difficult to see except in natural light. Sunlight is the best way to observe this rare color. 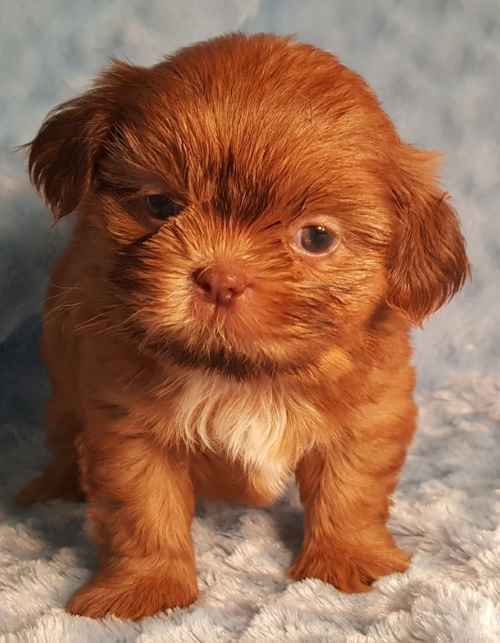 So, if you are contemplating the purchase of a true blue colored Shih Tzu, it is best to visit the breeder personally rather than depend on a photo on the Internet. Blue is considered to be a dilute from a genetics point of view. A dilution occurs when the pigment (either black or brown) has been affected by an additional dilution gene. When this occurs pigment is clumped differently and distributed irregularly. If the pigment is black, then the dilution will result in the blue color. If the pigment is brown, the color that is produced is a silvery color called isabella or lilac. You will hear Shih Tzu breeders call this color, "lavender." 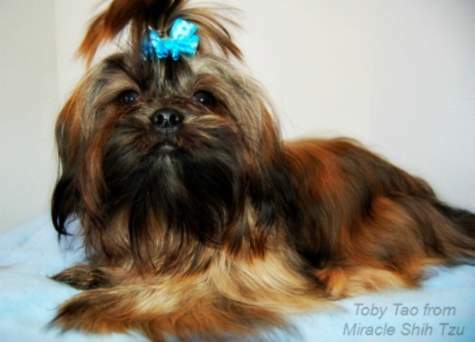 AKC recognizes the blue but does not list the isabella or lavender color as part of their standard. This dilution gene only affects the pigment of the nose, eye rims and other points. It has no effect on the coat color. Another Shih Tzu Coat Colors combination of two colors includes dogs with red and gold coloration but this combination does not appear on the official AKC Registration paperwork, even though it exists. When there are two combinations, the color patterns can have endless possibilities. No two Shih Tzu with two colors will ever look alike. Symmetry in color combinations is highly desirable, but not necessary. Here is a red and white Shih Tzu. The red looks orange to the eye but should not be confused with the lighter colored golds. A designation of black and white includes all dogs with black and white markings. A term that you may see come up from time to time is piebald. The white that appears on a black and white dog is determined by the gene on the S locus. White spotting or white areas are basically the same and can occur on any color including black. The white hair occurs when the skin cells cannot produce any pigment resulting in a pinkish skin and white hair. The nails and paw pads may also become white or pick where there is not pigment produced. Some of the more interesting patterns we see in Shih Tzu dogs occur in the black and white ones. See patterns below. In addition to the Shih Tzu coat colors, and combinations, certain markings on the fur can occur. Each has its own terminology. You might think of the Lone Ranger or Batman, but the mask on a Shih Tzu is quite different. Sometimes a dog will have a black coloring of hair on his muzzle which may extend towards his eyes and on his ears and even up towards his forehead. This is called a black mask. The rest of the hair can be another color such as gold or red. A very rare colored marking called Dobie markings occurs when a puppy is born with tan markings on an otherwise black or very dark coat. 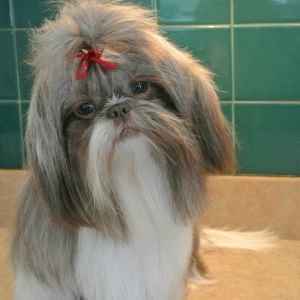 This would be in addition to the normal Shih Tzu Coat Colors mentioned above. These markings can be found above the eyes, on the jowls, on the lower legs, and under the tail. 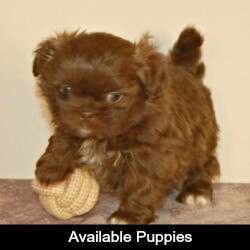 This is considered very rare and breeders will often sell these pups at a premium. They are called "dobie" markings because they resemble the coloration seen on the Doberman Pinscher. These colors and marking are relatively rare since they come from recessive genes, meaning that both parents of a puppy must “carry” that recessive gene for the puppy to have that color or marking and not all puppies from those parents will show the dobie marking. Another interesting occurrence in hair color is black tips. When the puppy is born, the coat is one color such as red or gold with black tips at the ends of the hair shaft. 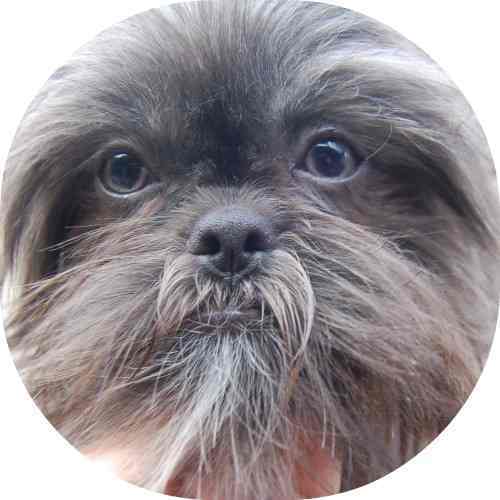 This occurs over the body and should not be confused by the black that some Shih Tzu dogs have on their ears. This black tipping disappears entirely after the puppy's first hair cut, but is very striking and beautiful when the dog is young or if the dog remains in full coat. Another interesting phenomenon of Shih Tzu coat colors is that they tend to change over time, most will lighten somewhat which is called fading and others turn gray or graying. It is not uncommon to see a color marked on the AKC paperwork for a puppy at 8 weeks that is totally different from the reality of the adult coat color. So, heed a word of warming, that color you fell in love with at 8 weeks of age may be completely different by the time they reach their first birthday. What causes these color changes? Very simply, it's all in the genes. Two distinct genes determine whether a Shih Tzu's coat will lighten or gray over time. I don't mean to get to technical on you, but basically there are two genes at work in these processes. Fading: If a Shih Tzu carries the "G" gene, his coat will fade as he gets older. You will notice fading in puppies as young as a month old. Sometimes puppies look like they are almost black at birth but by the time they get their taste of dog food for the first time, their coat has changed. Fading will continue until the dog reaches his first birthday. Graying: If a dog carries the Chinchilla gene (CH series) he is likely to change colors as well, but not in the same way as fading. Instead, the dog's coat will turn a rich, silver color. Someone once asked me if my dog was aging prematurely at two. No, its just that gene at work! Here is Ricky at 8 weeks old. He has black tips but its difficult to see in this photograph. His coloring is very dark, almost brindle in color with a black mask. Here is Ricky again all grown up. Same dog, but his color is completely different. He has retained his black mask, but all black tipping goes away with the first haircut. Flare: this occurs when the blaze (above) widens as it approaches the top of the skull. Collar or shawl: As the name suggests, it is the marking around the neck which is usually white. Saddle: A large patch of color, often white, over the back where a saddle would go if it were a horse. Tuxedo: This is an interesting design where a white patch of hair can be found on the chest of an otherwise solid colored dog. The color is often on the chin and sometimes on the feet. When you put it all together, it resembles a Tuxedo! So how does one choose a color? It is really all about personal preferences. A light colored coat will require more bathing and grooming. A white coloration on the face, around the muzzle or under the eyes can stain easily and will require frequent washing. You will likely be dealing with tear staining. 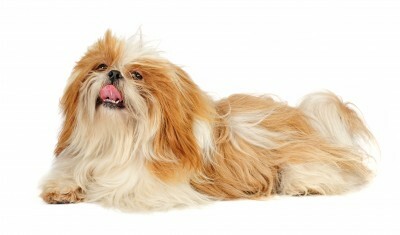 Products that eliminate tear stains may be necessary in these light colored Shih Tzu. Chocolates are “hot” now and rare colors are more expensive. Colors are beautiful, but hair and point colors are only “skin deep.” The true personality and amazing characteristics of the breed goes deep and comes in any color! Many people choose a name based on their Shih Tzu Coat Color. 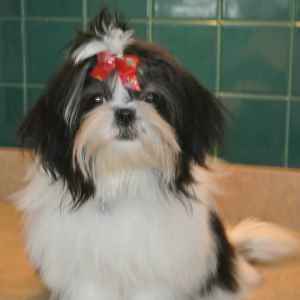 For example, check out our Shih Tzu Names Pages to learn more. What Color is Your Tzu, Now and as a Puppy? Have something to Say? Have something to say about Shih Tzu Coat Colors? Tell us about your dog's coat, color, texture? Did your Tzu's coat colors change over time? Were you surprised? What is about your Tzu's coat that you love? What is it that you would change if that were even possible? Don't forget to add some pictures. After all, a picture is worth a 1000 words. I think Theo is brindle but I'm not sure.